Hi again, from the Big Blue! The last two days we've been at port in San Francisco, a city I'm familiar with, but oddly enough I had never been to some of its most famous locations. 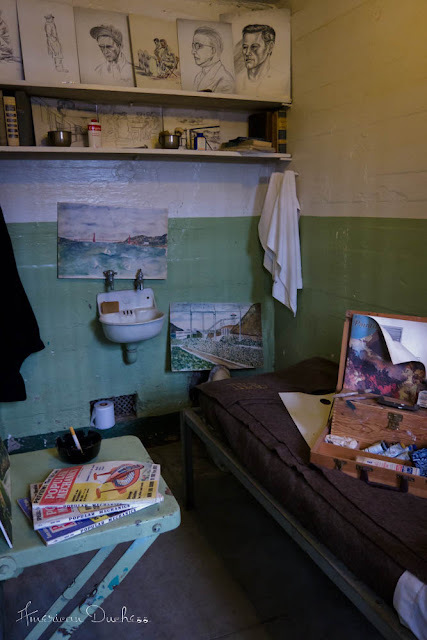 One of the cells at Alcatraz, full of drawings and paintings, from one of the prisoners who did "good time." 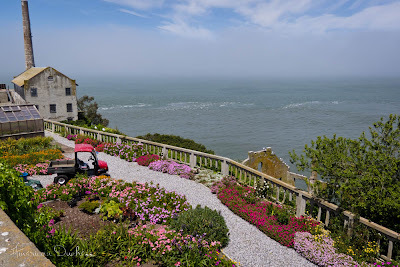 Carolyn and I went to Alcatraz, which was thoroughly fascinating, if not completely creepy. We didn't wear costumes off-ship, but did change in to "time travelers" attire for dinner that evening - she in 1920s, I in 1950s. I could get used to the old-fashioned idea of "dressing for dinner." It makes a whole event out of something we consider quite mundane. 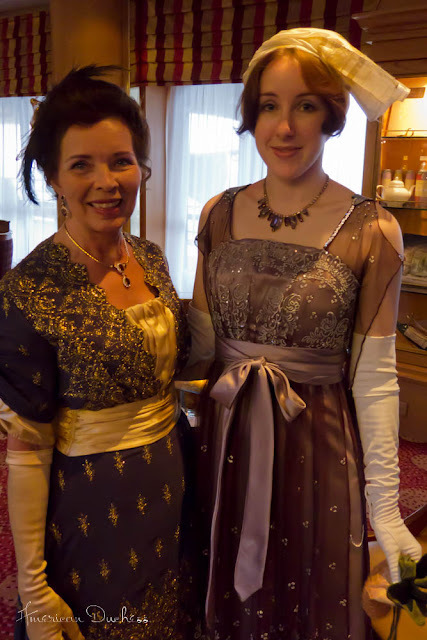 Several nights ago was "formal" night, and Carolyn and I wore our 1912 gowns, both of which were purple and covered in glittery bits. 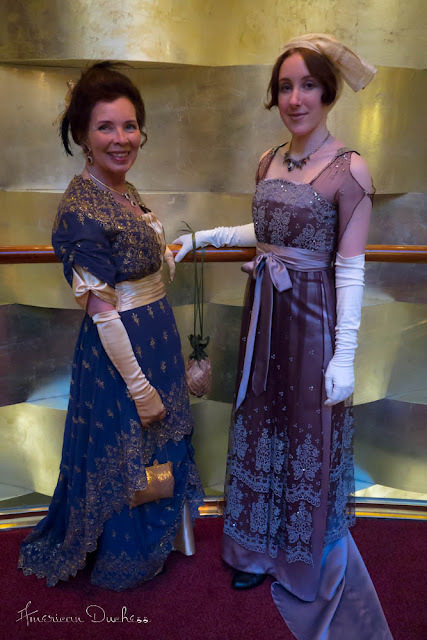 We were certainly the best dressed ladies on board, and I was pleased to get a chance to wear my dress again, after Gaskells. Carolyn was stunning, in her pruple and gold embroidered sari gown, one she custom-draped herself. 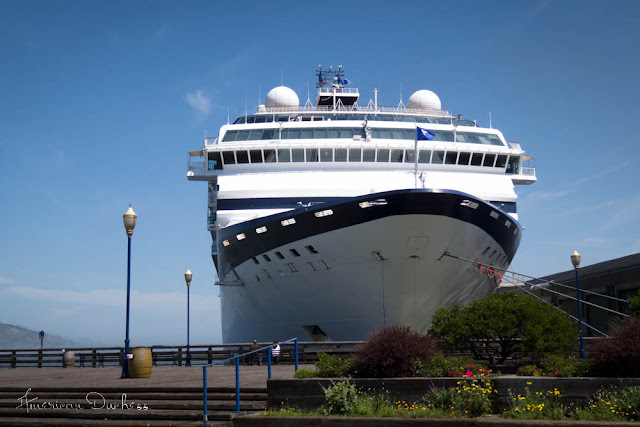 Tomorrow we're on our way to Astoria, Oregon, and Carolyn and I will be speaking about the history of this oldest city west of the Rockies. We'll be in 1811 day gowns, complete with spencers and turbans. These will be our "oldest" costumes of the trip, and bound to make people curious. Pics soon! You both look fantastic. Post more pictures of the trip when you can! I'm sure you turned a lot of heads at the dinner! I've always thought the idea of dressing for dinner was rather odd. Why put on your best clothes for the time of day you are most likely to spill food on them? Well, maybe people were less clumsy and actually had table manners back then. You all look fabulous and Alcatraz is surprisingly pretty. ah! I see in her 1920s outfit Carolyn is wearing white astorias... Am I correct? 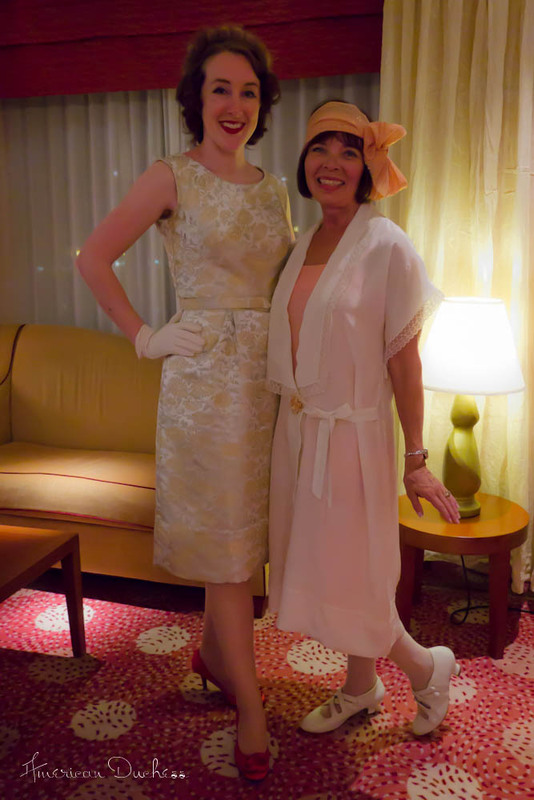 Yes, Carolyn is wearing a pair of sample Astorias in ivory, and I was wearing the black sample. The calf leather, perfect Astorias arrived while I was on this cruise - poor Chris is at home shipping them out! What fun! You look lovely! So much sparkly goodness! You both look truly amazing.